Sprouts are a staple you will always find in my fridge. Why? Sprouts are high in enzymes which help you digest your food, getting the most nutrients out of it as possible. You can sprout at home or you can buy a range of different sprouts at the shops – my favourite being mung bean spouts (oh, such a typical “vegan” comment hahaha) broccoli sprouts, snow pea sprouts and alfalfa sprouts. 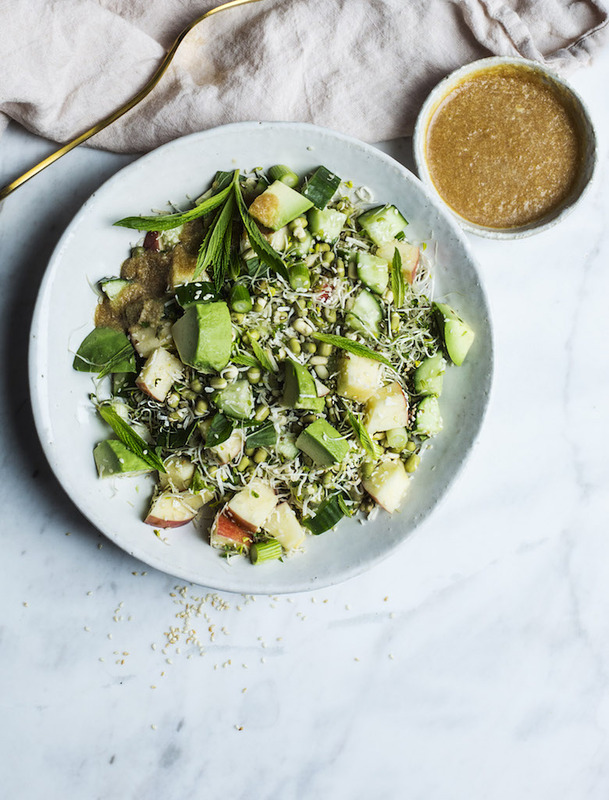 In this salad they really come to life with the kick from this amazing ginger dressing, which you shouldn’t restrict to just this salad! 1/3 cup sesame seeds, toasted lightly on in a dry frypan for 3 minutes. Make the dressing by blitzing in a blender for a few minutes until smooth. Combine the salad ingredients in a large bowl. When you make this, I recommend serving it with the dressing seperate so each person can put their own on, as if you do it earlier, the sprouts get soggy!